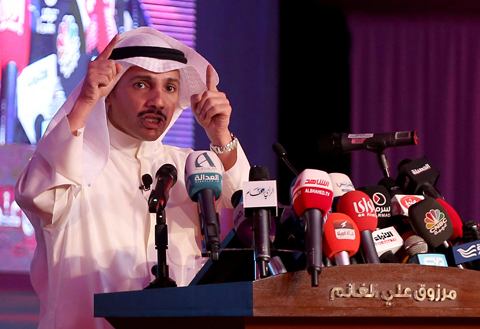 KUWAIT: Speaker of the dissolved National Assembly Marzouq Al-Ghanem, under fire by leading opposition figures, yesterday hit back in a composed but fiery speech, charging he is being targeted by a “gang plotting to capture the government”. Ghanem, a member of one of Kuwait’s top business families, was elected speaker of the 2013 Assembly, which was dissolved by HH the Amir last month after a dispute with the government over hiking petrol prices. A large number of opposition candidates and their supporters have made Ghanem their top election target, as many candidates said they will not vote for him for the speakership of the next Assembly, which will be elected on Nov 26. But Ghanem’s response was equally devastating. At a lengthy election rally speech that lasted for well over two hours, Ghanem displayed official documents showing his opponents conspiring against him and even against the country. He did not name anyone, but made a very explicit reference to two leading members of the ruling family, with whom he has been at loggerheads for a very long time. “I am facing on your behalf and on behalf of the Kuwaiti people the head of the snake and his partner … I am confronting the thief of the oil tanker company” during the Iraqi invasion in 1990-91, he said. Ghanem was clearly referring to Sheikh Ali Al-Khalifa Al-Sabah, the former oil and finance minister, who was the owner of Al-Watan media establishment which was shut down by the government and backed by the courts. His partner is Sheikh Ahmad Al-Fahd Al-Sabah, a former energy minister. Ghanem charged that his opponents have been hatching conspiracies through social networks and faking videos in “operation rooms” to discredit their opponents. “These people have no fear of Allah. They have no values,” Ghanem charged. The former speaker said he will not back down regardless of the strength of his enemies. He also alleged state security was spying on his phone. The opposition and its supporters accuse Ghanem of leading a rubberstamp Assembly that completely surrendered to the government and issued highly unpopular legislations and decisions like reducing subsidies to boost non-oil revenues after oil prices plunged. But Ghanem detailed the achievements of the previous Assembly, saying it passed 114 laws, the highest number of legislations passed since the first Assembly in 1963, including founding the Anti-Corruption Authority, the consumer protection law and a law that allowed individuals to file cases at the constitutional court. Responding to fresh accusations made by the opposition just a few minutes before he started his speech, Ghanem said he has asked the Anti-Corruption Authority to launch an investigation into a suspected scam involving him.